Mocha diffusion is a technique of layering slips onto ware so that the edges of the upper one bleed outward into the lower. An alkali/acid mechanism is employed. The lower layer is a typical water based slip (usually white or cream) that is gelled enough to stay stable on the ware and wet long enough to apply the upper layer. Plastic slips (those high in bentonite or ball clay) work the best. The upper layer is acid-based and stained and very runny, people use a wide range acidic solutions (like tobacco or lemon juice, vinegar). When the stained acid is painted over the wet base its edges bleed outward in accordance with the fluidities and degree of difference in pH. The effect survives firing well. 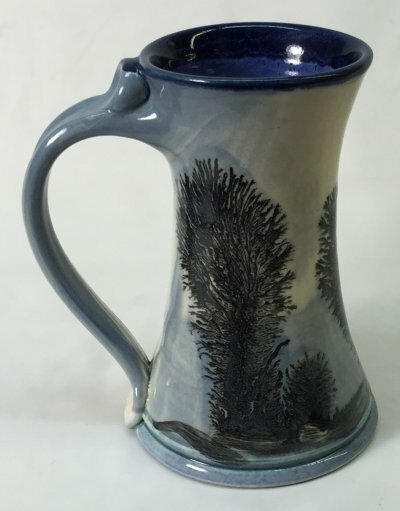 M370 mug using M370 clear glaze by Victor Duffhues. It can be difficult to find an engobe that is drying and firing compatible with your body. It is better to understand, formulate and tune your own slip to your own body, glaze and process.